Philly Webcast - Tech, phones, computers: Tears of Joy, The Phillies are in the playoffs! Tears of Joy, The Phillies are in the playoffs! What a ballgame! Just got back from Citizen's Bank Park. Yes, me and my Mrs. we were just a couple of the many who stayed an hour and a half after the game. Talk about a celebration. Fans cried their eyes out with the final pitch that put the Phillies into the playoffs.. They jumped for joy like little kids, they ran around the stadium uncontrollably screaming and shouting for joy. This was one of the best games that I've ever been to. Fans were clapping at just about every pitch. They cheered Jamie Moyer and gave him a standing ovation when he entered the field to go out and warm up 40 minutes before the game started. 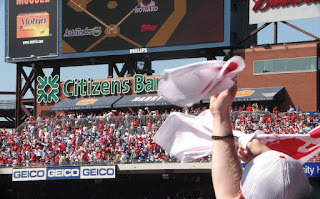 Fans waved their rally towels when they saw the Mets score prior to the start of the Phillies game. There was excitement filling the air at every possible moment. The Mets were getting beat up before the Phillies game even started. Even still, the Phillies had their own work cut out for them and had to win this ballgame today to win the division assuming the Mets would go on and lose their game. What a feeling, what a day. I wore a throwback Richie Asburn jersey #1 to the game today, I was stopped by several fans and told what a nice jersey, and yes it is. One, as in one more game, one more victory and the chance to become Number 1. The Phillies did just that, in a matter of two weeks what started out looking like they may not make the playoffs at all, turned into the sweetest of victories, the greatest of wins, and the thrill of winning the NL East on the last day of the season. This surge by the Phillies will be remembered by their fans, the players on the field and anyone who had an interest in baseball and watched the duel that played out between the NY Mets and the Phillies. Jimmy Rollins said in the beginning of the year that they were the team to beat. He was a little wrong the Mets were the team to beat most of the year, but the Phillies became the team that in the end no one else would beat them as they pulled out a miracle at Citizen's Bank Park and took the NL East on September 30, 2007 !! !